2018, my first full year at Austin College, was one to remember—a year of listening and learning, a year of asking “What’s Next?” and a year of taking action. In August, we welcomed the largest first year class in our College’s history. In November, our most ambitious campaign ever was launched: POWER Austin College. Treasure Our Legacy. Transform Our Future. We are well on our way to meeting the goal of $125 million to grow our endowment, refresh our spaces, and continue to keep Austin College accessible and affordable. 2018 was also a year of new and enhanced academic programs: the Morris Foundation Product Lab, a refreshed Hoxie Thompson Auditorium, new water polo teams, an esports club, new tennis courts under construction, exciting research, deepened writing skills, new knowledge, and heightened citizenship in a global community. 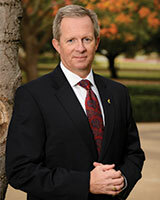 As we look to the future, I see great optimism, innovation, and energy on our campus and throughout ’RooNation. As a matter of fact, the latest example of AC innovation is quite literally in your hands. You are holding the new-look Austin College Magazine. Today, we know that people gather their information in new ways. The internet and social media outlets are where the world, including ’RooNation, goes for instant news. The [at]AC e-Newsletter, social media postings, and ’Roos in the News keep us up to date, and we no longer depend on a bi-annual printed magazine from the College the way we used to. Indeed, in a world of technology that puts the news in the palm of our hand, we are seizing this opportunity to do something new. Introducing, the new Austin College Magazine! It will be an annual publication that is meant as a collectible piece of AC history—somewhere between a National Geographic and a Year in Review—to be displayed in your home or workplace throughout the year rather than something you read and discard when you’re finished. This new publication is colorful, vibrant, and, we believe, something you’ll want to go back to from time to time and share with friends as a conversation piece. We’re proud of the new design and believe it captures a contemporary spirit with an enduring nod to tradition—a lot like our Texas roots. It’s what’s new, what’s happening, and, of course, what’s next. We hope you like it. 2019 is off and running. Our momentum continues to build, and Austin College’s future has never looked brighter. Thank you to all of ’RooNation for your support as we Treasure Our Legacy. Transform Our Future. I look forward to an exciting year ahead and hope to see you soon.